I’m a big fan of Tanith Lee. Like many great fantasy writers, Lee understood that to truly transport a reader, it’s not enough to talk about dragons or swords or magic systems. Readers are transported just as much or more by the way these things are talked about. Lee’s work has that eerie, otherworldly feel that characterizes the best works of this genre. She could make a story about a squirrel looking for nuts feel like something dredged from a forgotten and more romantic epoch. And sometimes, that’s… well, more or less what she did. Lee’s writing has sparked life into many prosaic ideas. But where she really showed her mettle was when she settled onto an idea worthy of her. With that said, Companions on the Road (at least as it presently exists) is a compilation work of two novellas. Both are good, but one is great. I’m going to start with that one. 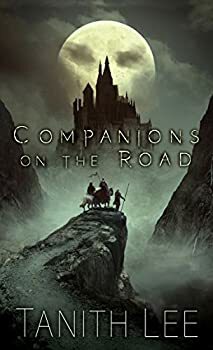 So, let’s get to the titular “Companions on the Road.” It’s a simple enough story: a cowardly thief, a handsome jerk, and a kindly soldier rob a magician’s sanctum for their own specific reasons. In doing so, they bring down a terrifying curse. I won’t say that the plot is entirely original, but the story is told in that inimitable Tanith Lee style that makes me remember why I got into reading Fantasy in the first place. Lee manages her larger-than-life characters with admirable panache, her imagery is lovely, and the mingled menace and mythic grandeur of the goings-on adds up to a genuinely great experience. I loved this one. Overall, Companions on the Road is a fine collection and a great starting point for the reader interested in getting into Tanith Lee’s work. The first story is definitely a bit stronger than the second, but both have solid merits. Recommended. Published in 1975. These classic fantasy novellas from master fantasist Lee relay the tales of brave adventurers whose lives are forever changed by the strange relics they encounter. The Chalice: Kachil the brigand, Feluce the rogue, and Havor the gallant–a night of blood and blood-red flames unites them in a grim siege, fabulous theft, and a journey fraught with peril. For their prize is the jeweled and golden cup of Avilllis, and their road will not end until the Force of Darkness destroys them…or yields to a far greater Power. The Ring, The Jewel, The Bone: These are the Relics. The Mysteries of the Shrine, known only to the priestess. Only to Oaive. Yet he knows of them–the wolflike stranger from beyond the mists. And when he profanes them, there begins a game of cold sorceries and burning shadows to be played through all eternity…one way or another. I read this, but I don’t remember anything except loving her beautiful prose. I’ll have to re-read it now. I think I’ve only read one book by Tanith Lee in my life, A Heroine of the World, which mostly left me cold. Maybe I need to give her another shot. Read some of the earlier stuff. You might want to try BIRTHGRAVE and the sequel, whose name has fled into the wilderness at this moment. Or the “Flat earth” books which are shorter and beautiful.